A strong preference for evergreen forest is shown by four species of ground-rollers, which keep to the heavily shaded undergrowth or forest floor. Occurring only in a narrow coastal strip of arid southwestern Madagascar, the long-tailed ground-roller prefers low, fairly dense deciduous woodland with a sparse groundcover on sandy soil. 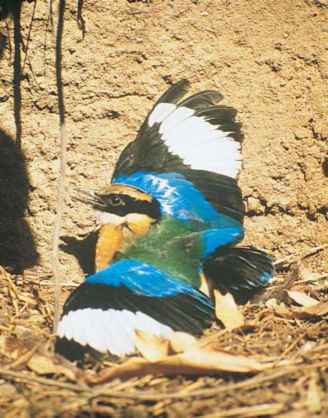 bellied roller is very much an inhabitant of Isoberlinia woodlands, and the racket-tailed roller (Coracias spatulata) from southern Africa shows a preference for woodlands in which Brachystegia, Colophospermum, or Baikaea trees dominate. Other species appear to exhibit no marked habitat preferences.